for it was near: and it was easy to return by that road to Egypt. There are also many aggadic midrashim [regarding this]. I am of the opinion that it is more the latter. He is saying that these midrashim are outside the scope and concern of his own commentary. You can go to those midrashim if you want to see those midrashim, but here, the focus is on peshat and a certain kind of midrash. Note how he employs the word הרבה (many) regarding those midrashim he does not bring. 8And they heard the voice of the Lord God going in the garden to the direction of the sun, and the man and his wife hid from before the Lord God in the midst of the trees of the garden. And they heard: There are many Aggadic midrashim, and our Sages already arranged them in their proper order in Genesis Rabbah and in other midrashim, but I have come only [to teach] the simple meaning of the Scripture and such Aggadah that clarifies the words of the verses, each word in its proper way. הוא הדבר שאמר הקדוש ברוך הוא למשה: בהוציאך את העם ממצרים תעבדון האלהים על ההר הזה. קרוב הדרך לשוב למצרים, שנאמר: דרך שלשת ימים נלך במדבר. קרובה השבועה שנשבע אברהם לאבימלך: השבעה לי באלהים אם תשקור לי ולניני ולנכדי, ועדיין נכדו קיים. קרובה השבועה, מלחמה ראשונה לשניה. בקרוב ירשו כנעניים את הארץ, שנאמר: ודור רביעי ישובו הנה. ולמה לא הביאן הכתוב דרך פשוטה לארץ ישראל אלא דרך המדבר? אמר הקדוש ברוך הוא: אם אני מביא עכשו את ישראל לארץ, מיד מחזיקים אדם בשדהו ואדם בכרמו. והן בטלים מן התורה, אלא אקיפם במדבר ארבעים שנה שיהיו אוכלים מן ושותים מי הבאר. והתורה נבללת בגופן. לא ניתנה התורה לדרוש אלא לאוכלי המן. ושווין להם אוכלי תרומה. לא הביאן המקום בפישוטן, אלא כיון ששמעו כנעניים שישראל נכנסו עמדו ושרפו כל הזרעים וקבצו כל האילנות וסתרו את הבניינים וסתמו את המעיינות. אמר הקב"ה: לא הבטחתים לאבותם שאכניסן לארץ חריבה אלא מלאה כל טוב, שנאמר: ובתים מלאים כל טוב, אלא הריני מקיפן במדבר ארבעים שנה עד שיעמדו כנעניים ויתקנו מה שקלקלו. Another explanation, for it is near [karov] -- the oath which Avraham swore to Avimelech is near. (Bereishit 21:23) הִשָּׁבְעָה לִּי בֵאלֹהִים הֵנָּה, אִם-תִּשְׁקֹר לִי, וּלְנִינִי וּלְנֶכְדִּי, “swear unto me here by God that thou wilt not deal falsely with me, nor with my son, nor with my son's son”. And his grandson was still alive. Another explanation: For it is near: The oath [sic] first battle is too close to the second one. Another explanation: For it is near: [Only] recently, the Canaanites inherited the land, for it is written (Bereishit 15:16) [וְדוֹר רְבִיעִי, יָשׁוּבוּ הֵנָּה: [כִּי לֹא-שָׁלֵם עֲו‍ֹן הָאֱמֹרִי, עַד-הֵנָּה, And in the fourth generation they shall come back hither [for the iniquity of the Amorite is not yet full]. And why didn’t the Scriptures [sic] bring them in a straight path, but rather by way of the wilderness? Hashem said: If I bring them now to the land of Israel, each person will immediately take hold of his field or vineyard, and they will be disengaged from the Torah. Rather, I will take them around in the wilderness for forty years, while they eat manna and drink the water of the Well [of Miriam], and the Torah will be stirred into their bodies. From here Rabbi Shimon said: the Torah was given to be expounded only for those who ate the manna. And equivalent to them, those who eat Terumah. It is possible that Rashi simply thought that these midrashim were too good to miss, and so he referred us to them. But it is also quite possible that he is rejecting these “many” midrashim from his peshat commentary because they don’t fit his criteria. Rashi does not proffer the following peshat explanation: “And God did not take them by way of the land of the Philistines, though it was near.” This would require taking the word כִּי to mean “though”. Indeed, all of the midrashim take כִּי to mean “for”. In large part, this is because midrash is hyper-literal. Once כִּי means “for”, this introduces a problem. Why should the closeness be a reason to avoid the land of the Philistines? It should be a reason to go that way, rather than to avoid it. Therefore, they consider the various possible meanings, or rather allusions, of the next word, karov. In this way, ki karov is once a reason to avoid that way, and that land. This midrashic-peshat also works out with the rest of the pasuk, which has a second כִּי. This second כִּי certainly means “for”. Thus, כִּי | אָמַר אֱלֹהִים פֶּן יִנָּחֵם הָעָם בִּרְאֹתָם מִלְחָמָה וְשָׁבוּ מִצְרָיְמָה. Thus, the two reasons are linked. Because it was near, and because Hashem was afraid they would return to Egypt. In contrast, most of the other midrashic explanations have the first כִּי as a different reason. To give the land time to recoup, to allow the Canaanites their four generations, because the oath to the surviving grandson of Avimelech hadn’t passed, because Hashem wanted them to learn Torah. I would suggest that when Rashi lists as a criterion (in Bereishit) for including a midrash aggadah, as ולאגדה המישבת דברי המקרא דבר דבור על אופניו, the words דבור על אופניו means that it works out well with the rest of the words in that pasuk, and with the flow of the narrative and the text. And having the two explanations mesh together would then fulfill the criterion. It is then perhaps surprising that Rashi doesn’t mention the battle waged by the Tribe of Ephraim who fled Egypt early, and were killed by the Philistines. This midrash might be a candidate for inclusion. 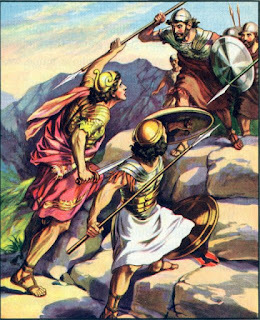 One battle with the Philistines was too close to another battle with the Philistines. And this, in turn, would be a cause to flee back to Egypt. It fits in nicely with the specific mention of the land of the Philistines. And the milchama would be the milchama with the Philistines. (Or, alternatively, the milchama would be the result of the prior milchama, vis. the corpses of the Ephraimites, as one position in the Mechilta gives it: שלא יראו עצמות אחיהם מושלכין בפלשת ויחזרו להם.) I would answer that indeed, this might have been a selection, but Rashi already selected his one midrash and developed it at quite some length -- in his comment on this phrase as well as in the other phrases in this pasuk. Further, he was already dismissing a bunch of midrashim, and this one went with the bunch. And finally, the one Rashi in fact selected is much more of a peshat-oriented midrash than this one. We don’t have to bring in a whole other story which would be only hinted at / alluded to by a word here or there. Rather, we can make sense of the entire pasuk as a self-contained unit. This pasuk, and the underlined word, comes into play in Menachot 29b. Rami bar Tamrei, who was the father-in-law of Rami bar Dikulei encountered a vav in ויהרג whose leg was severed with a hole [so that it looked like a yud]. He came before Rabbi Zera, who said to him: bring a child who is neither wise nor foolish. If he reads it ויהרג then it is kosher. If not, then it is יהרג and it is pasul. To explain, if the vav is severed, then it perhaps looks like a yud. And recall that there are no nekudot in a Sefer Torah, only consonants. If the word is written ויהרג, then the word would be וַיַּהֲרֹג , vayaharog, “and He killed”. Meanwhile, if the verb were a passive verb, meaning “and he was killed”, then it would be וַיֵּהָרֵג. This is because the imperfect would be of the form yikkatev, יִכָּתֵב, with a chirik under the yud, gemination (doubling via dagesh) of the first root letter (kaf), kametz, second root letter (tav), tzeirei, and final root letter (vet). With a root of הרג, the first root letter is a guttural and so cannot receive gemination to double it. Instead, due to a process of compensatory lengthening, the chirik under the yud is lengthened to a tzeirei. And the vav hahipuch (va + gemination of the yud via a dagesh) turns the imperfect into a perfect. If the word were ייהרג, then it would not conform to the typical spelling of words in Tanach. However, that would be valid in Mishnaic Hebrew as a way of writing יֵיהָרֵג, as a way of making the nikkud clear. We find this in the Mishna in Sotah 9:7 and Makkot 1:10, as well as in a few Yerushalmis and Bavlis. Further, there is only a single instance of the word ויהרג in the Torah -- the pasuk in parashat Bo cited above. There are instances of the word in Nach, but recall that the question was whether the text was kasher or pasul, which makes more sense in the context of Torah. Further, when looking only at the two words in sequence, one is a straightforward reading and the other is blaspheming. In the former, Hashem kills. In the latter, Hashem is killed. Putting aside any blasphemy, in the context on the pasuk, for someone who can read fluently and understand context, it is obvious that it is Hashem killing the firstborn of Egypt, rather than vice versa. That is, because of the hole, it appeared something like a yud. If the child were wise, he would know that the passive reading was blasphemy and he would be influenced, perhaps inappropriately, to read it it as וַיַּהֲרֹג. And if the child were foolish, he would only know how to read a complete letter, and so couldn’t weigh in as to what the letter / word appears most like. The implication of this deduction of Tosafot appears to be that, in the time of the Ri, there was some doubt as to the correct spelling of the Torah text, with some [all?] Sifrei Torah spelling the word malei. Otherwise, why bother to make such an observation. To explain Tosafot, if the word in the Torah were spelled malei vav, with a vav between the resh and the gimel, then it would have to be the active verb, with a cholam, because if it were the passive verb, then there should be a tzeirei between the resh and the gimel. Since the gemara implies some ambiguity, the word must have been spelled chaser vav. While this proof is pretty solid, one might have some doubt as to the strength of this proof. For one thing, if the gemara wanted to say that the implication is ייהרג, it could have easily put in an extra yud. Elsewhere, in Mishnayot and Gemarot, it makes use of the double-yud. Also, the idea that it is blaspheming is present in Rashi, but not in the gemara itself. Maybe it would have been interpreted as a smudge or dot, rather than being reinterpreted as a yud. It depends how vavs were written back then. E.g. from Bar Kochba’s letters, look at the vav of Shimon. If so, then we could say that ואי לא יהרג הוא ופסול means that if not, it is yaharog, just without the initial vav. The word איפסקיה and the word כרעא imply a severing of part of it, though. such that we don’t know exactly how the non-ויהרג Torah text is to be read. So it actually has ייהרג with two yuds. The others are not particularly interesting. Vilna and Venice: essentially the same as Vatican, with the יהרג given. There also is a variation whether it is the כרעא of the vav, or just the vav, which is severed. And we indeed see the word דהוא rather than דהוא חמוה. Also, I would note, this should be obvious. Tamrei and Dikulei both mean date-palm. רמי איפסיקא ליה כרעא דוא"ו ויהרג בנוקבא -- to explain, the vav [in the beginning of ויהרג] occurred in the place of a hole [in the parchment] and it seemed like a yud. אי קרי ויהרג כשר ואי לא ייהרג הוא ופסול. And the Ri [in Tosafot] comments that from here it is implied that ויהרג is chaser, without a vav between the resh and the gimel, end citation in the Aguda [?]. And see as well in the Mordechai, perek Hakometz. And it does not reckon ויהרג of here [in Shemot]. We thus deduce that it is chaser. And so too in sefer haTerumah and the Rama, za”l. The Mordechai writes that it is spelled chaser in most sefarim, and that the ambiguity is evidence that it is chaser. And though it is not concrete proof [raayah], it is a zecher [supporting evidence].